IIFT 2016 exam is just around the corner. While your preparation for Quant and Verbal must be great, it is important that you do not neglect General Knowledge. There is nothing more heartbreaking than to find a student who has cleared the overall cutoff for IIFT but missed out because he / she did not clear the sectional cutoff for GK. Before you ask – Yes! There is a sectional cutoff for GK in IIFT. It is on the lower side but it is definitely there. I will discussing some ideas around General Knowledge Preparation for IIFT in the free class on Thursday (8 PM). 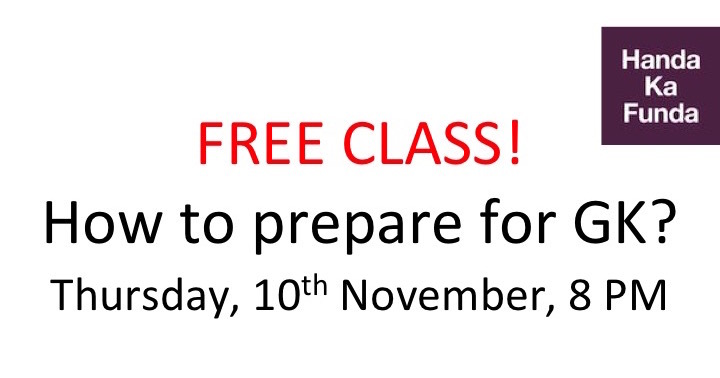 MISB Bocconi, a Mumbai based business school, has graciously decided to sponsor the free class. You can register for the class by filling up the form given below. Two hours before the class you would get a link on your registered email id, with which you would be able to attend the free class. This class is a part of our online GK coaching course for IIFT / XAT / SNAP. The course contains a large amount of documents, PPTs, and Factopedias. Factopedias are essentially video tutorials on important topics related to current affairs that we cover in the course. These are around 10 minutes each. Trust me, it is a lot easier to sit and watch a video on a topic than go through a long boring PDF. Other details about the course are available on the GK course page.